Most people who ride bicycles want to keep them in good shape, but first they need to know where to begin. Everyone understands the importance of regular preventative maintenance on an automobile, but many folks ignore this concept when it comes to their bicycle. A bicycle is a big investment and it’s important to keep it in sound working order not only for top performance, but also for the safety of the rider and those riding around him/her. 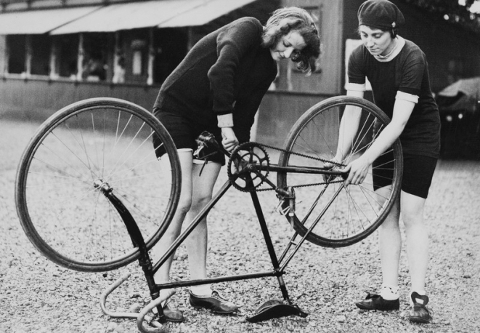 You might say you should get into the habit of caring for your bike like your life depended on it…it does! * Each Ride: Note-These procedures are necessary to ensure your personal safety. Failure to perform these checks could result in serious injury. I borrowed an acronym from the League of American Bicyclists and added a slight variation to help you with your daily safety check…don’t overlook it, it’s important! Don’t forget to Inspect and check for looseness in the: Stem binder bolt, Handlebar binder bolt, Seatpost binder bolt (or quick release), Seat fixing bolt, Crank bolts, Chainring bolts, Derailleur mounting bolts, Bottle cage bolts, Rack mounting bolts, Brake and derailleur cable anchors, Brake and shifter lever mounting bolts, Brake mounting bolts. Disassemble and overhaul; replace all bearings (if possible); and remove and if necessary replace all brake and shift cables. This should be performed at 6,000 miles if you ride more than that per year. If you often ride in the rain who get dirty should overhaul their bicycles more often. One of the first steps to being a winner is attitude. A well maintained bike bolsters confidence and enhances a positive attitude! This entry was posted in Bicycles, News, Restored and tagged air pressure, bike, Bottle cage bolts, Brake and derailleur cable, Brake and shifter lever, Brake mounting bolts, Chainring, checklist, Cranks, cycle, Derailleur, fixing, handlebar, maintenance, quick release, Rack mounting, Seat post, stem, stem, tires, vintage, wheels.